Lorenzo he would cope with going home alone if needed. If you have the purrfect home for Luca, then please call to arrange a meeting, thank you. Lorenzo is independent and likes to survey his land and keep a watchful eye on proceedings. 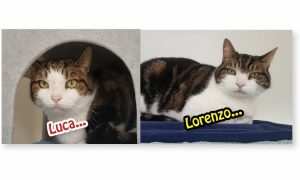 Although his brother Luca is more openly loving, Lorenzo brings a real strength of character to your relationship. A great pair both with different personalities that in a perfect world would find a home together but are happy to live apart too. If you would like to meet the boys then please call our centre, thank you.